Scientific imaging has long been a research strength at the University of Wisconsin-Madison, home of major advances in cellular-scale optical imaging, human-scale medical imaging and many spaces in between. 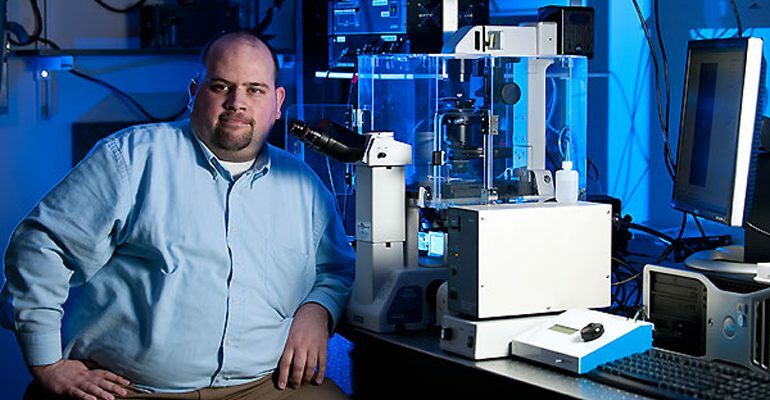 The “everything in between” is of keen interest to Kevin Eliceiri, director of the Graduate School’s Laboratory for Optical and Computational Instrumentation (LOCI) and new associate director of medical engineering at the Morgridge Institute for Research. Eliceiri sees great potential in bringing all of the different scales and modalities of imaging together to improve visual understanding of biology and disease — and address the things we can’t yet see. Eliceiri joined the Morgridge Institute this month and will serve an important role in the leadership transition period when Rock Mackie, director of Medical Engineering, retires at the end of 2014. But Eliceiri is no stranger to the program, having active research partnerships and collaborations for several years in both the medical engineering and virology focus areas at Morgridge. Eliceiri will be initiating a new research team in multi-scale imaging this fall, starting with hiring two new imaging principal investigators. The goal will be to “foment a community” with support from the new hires and build capacity with the best available talent, regardless of imaging modality. The idea will be to bring together different modalities and imaging size scales and look for ways they can register, link and operate together. That includes image size, temporal stages, and animal vs. human scales. One of the current strengths of the medical engineering program is the integration of student talent from the undergraduate to the postdoctoral level. Close to two-dozen students have independent research projects with Morgridge under the mentorship of Mackie, Eliceiri and other scientists. Current students have worked on projects such as creating better detection models for breast cancer, new radiotherapy techniques, and microfluidic approaches to testing new drugs. Eliceiri sees that relationship with engineering students continuing and expanding with the departments of biomedical engineering, (BME), electrical and computer engineering (ECE) and medical physics. BME has a strong curriculum program in biomedical design, with most projects stemming from real community-based needs in healthcare. BME students have worked with medical engineering on many of these projects. The Advanced Fabrication Laboratory will continue to be an important resource for faculty and student prototyping and innovation. It has unique resources in areas such as 3D printing and in microfluidics with the recently opened foundry in collaboration with BME Professor David Beebe. These instrumentation capabilities will serve as an important piece of the multi-scale imaging effort and enhance instrumentation efforts of the UW-Madison bioengineering community. Core partners in this effort will be the departments of biomedical engineering and medical physics. Major technology partners will include the departments of electrical and computer engineering, industrial and systems engineering, physics, chemistry, computer science and biostatistics and medical informatics. The biology partners will include the Virology Institute, the Comprehensive Cancer Center, biochemistry, cellular and molecular biology and others.